On Friday 8th June, the Salford Carbon Literacy Consortium and CL4RPs Consortiumjointly hosted an event at the University of Salford, MediaCityUK to discuss how Salford and Greater Manchester can achieve the challenging but necessary goal of reaching net zero carbon by 2038. A packed room of 45 delegates from a wide range of sectors including construction, primary and higher education, NHS and media were helped in their discussion (framed around the Talanoa Dialogue) by inspirational talks from Salford City Mayor, Paul Dennett; CEO of Northwards Housing and leader of the CL4RP’s Consortium, Robin Lawler, plus our special guest from the Centre for Alternative Technology, Paul Allen, an experienced climate change communicator and expert in how we can get to a Zero Carbon Britain. 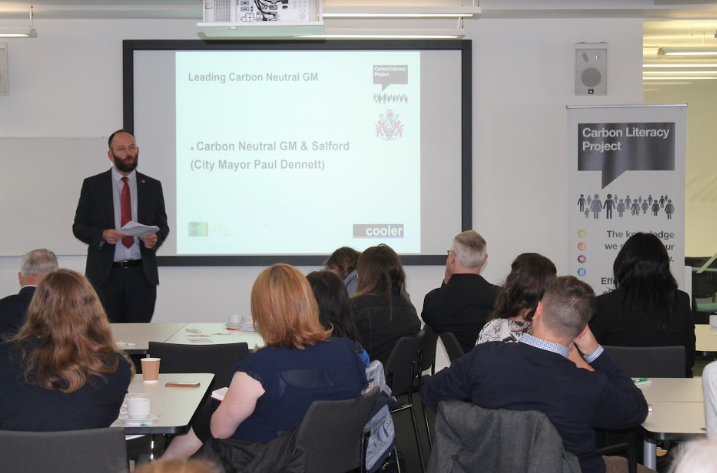 The event opened with City Mayor Paul Dennett’s thoughts on setting a zero carbon target in Greater Manchester after attending the Greater Manchester Green Summit in March this year. Paul explained that we must accelerate action in Salford to tackle climate change and talked about the importance of informing ourselves about why it is necessary to have a zero-carbon target. The City Mayor highlighted existing good practice in Salford, including the Greater Manchester Community Renewables scheme, raising funds to install solar panels on Salford primary schools. Robin Lawler, CEO of Northwards Housing and CL4RPs lead detailed how the social housing sector of Greater Manchester have engaged their staff in climate change learning. The CL4RPs consortium pooled resources to create shared Carbon Literacy courses and to train trainers. The consortium now has 2330 staff certified Carbon Literate across 20 organisations. Northwards Housing is now looking to engage their suppliers in Carbon Literacy, embedding climate change learning within the procurement process. Paul Allen then gave his talk “The Extraordinary Story of Human Beings, Energy and Happiness on the positive relationships between climate action and health, wellbeing and happiness to set the scene for the workshop element of the event. The research of Zero Carbon Britain (summarised in the reports ‘Zero Carbon Britain: Re-thinking the Future,’ ‘Global Scenarios: Who’s Getting Ready for Zero’ and ‘Zero Carbon Britain: Making it Happen’) clearly demonstrates that we have the tools and technology needed to reach zero carbon in the UK. The barriers to that change are now cultural and political. Paul explained that we must create spaces where inspiration, optimism and excitement are fostered around a new future. Paul also introduced the idea of ‘multi-solving’. Reducing carbon emissions also improve quality of life, addressing some of our key priorities; e.g., health, wellbeing and happiness, jobs and air pollution. In the workshop section, we asked our participants: ‘Where are we now?’, ‘Where do we want to get to?’ and ‘How do we get to a zero carbon Salford?’ The delegates responded that though we see small improvements in sustainability measures, with some sectors ahead of others, there is nowhere near enough activity on the low carbon agenda. The solutions proposed included improving knowledge, zero-carbon planning policies, sharing best practice and integrating solving climate change with promoting health and well-being. Not only did the participants discuss the questions posed to them. Many informal conversations were had, and new connections were made in the room. Delegates sharing ideas and best practice and forming new working relationships around Carbon Literacy and broader climate change mitigation is a core goal of running the Carbon Literacy consortium events.